Initially we got together in November 2004 to offer entertainment for visitors to our city, Waterford which hosted the Tall Ships Race in July 2005. However we had so much fun, we just had to keep on singing. Since then we have met every Monday night and have continued to expand our repertoire. And in keeping with the long naval tradition we drink an odd ration of grog. Our name comes from a lighthearted view of the old Cromwellian saying ....of getting there by Hook or by Crooke, which are two headlands here at the entrance to Waterford Harbour. 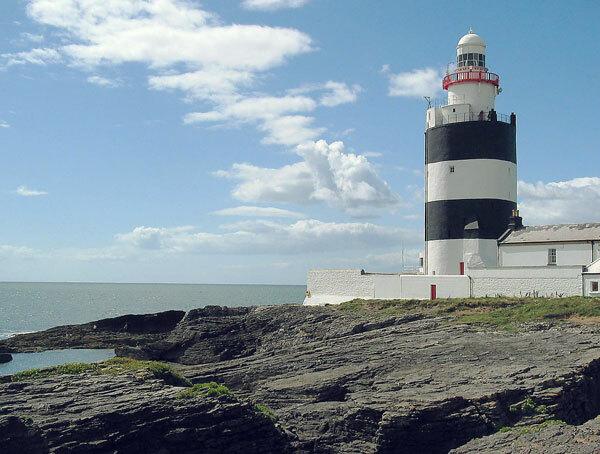 Hook Head lighthouse dominates the headland at the mouth of Waterford Harbour on the Wexford shore. Crooke is further upriver on the Waterford shore, where Crooke Church is the obvious landmark. Kennedy's of Callaghane is where we practice, sing and drink (every Monday night from September to May). Hooks and Crookes sing sea shanties and songs of the sea, for the enjoyment of our audiences and to sustain our musical heritage. Our home port is Waterford Harbour, where the three sister rivers collide into the Celtic Sea. On the eastern shore from Hook Head lighthouse, by Duncannon and Great Island up to the port of New Ross on the goodly River Barrow; upstream, the river Nore joins from the tidal village of Insitioge, below the City of Kilkenny. On the western shore, from the cove at Portally to Dunmore East, then by the church of Crooke, Passage East and rounding Cheekpoint, up past Little Island to the City of Waterford on the banks of the mighty River Suir. The best way of getting a flavour of what Hooks and Crookes are all about is to read the following diary of our previous performances and voyages.